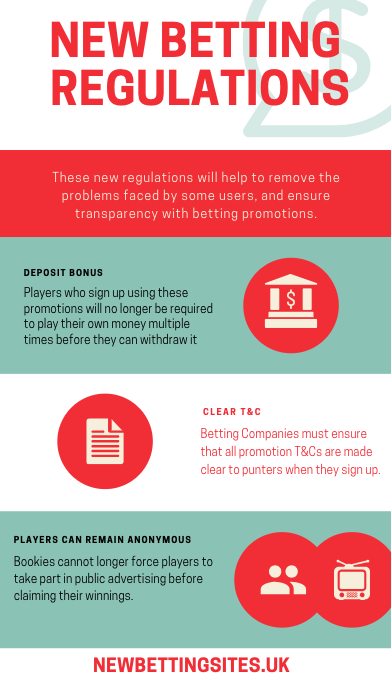 Over recent times, many new regulations have been brought in to try and clean up gambling and offer punters a fair deal. After many complaints from punters who felt like they have been unfairly treated, a number of new regulations have been brought in surrounding sign up promotions. These are very popular with both bookmakers and punters, and something that a lot of people take advantage of when they are opening a new account with a bookmaker. These sign up promotions have been under the spotlight recently, causing the new regulations to come into place. These new regulations will help cut out the problems faced by some people, and ensure transparency with these promotions. Players who sign up using these promotions will no longer be required to play their own money multiple times before they can withdraw it. This is a good move for punters, and will allow you to withdraw your own money if you wish without having to wait and risk on numerous occasions before being allowed to take it. This prevents the chance of punters losing their own money by having to bet it on numerous occasions. New Gambling firms must now ensure that any restrictions on playing are made clear to punters when they sign up. Vague terms have been used in the past, and these are no longer acceptable. This means when you are signing up you should see clearly which games are allowed and which are not when using your bonus, allowing you to make a decision as to whether the promotion suits the games you like to play. By being able to do this before you sign up, you can walk away if you wish to. Gambling companies must no longer force players to take part in publicity before claiming their winnings. This is something that a handful of bookmakers did in an attempt to create awareness of their brand and gain promotions. They are no longer allowed to do this, meaning that if you take part and want to remain anonymous then you can do so, keeping your gambling to yourself without having to promote them.There have been some big changes with gambling regulations recently, and much of that goes in the favour of the punters. A lot of people like to take advantage of the sign up offers that are available with bookmakers, but these offers have not been regulated properly in the past, and have caused problems for some players who have taken advantage. These problems are now being ironed out, making things a lot more transparent and easier for punters to understand. This will help you out, and allow you to make better, and more informed decisions when you are deciding if you want to sign up with a new bookmaker, and which one you want to sign up with when you do so.